ABC: The once-solid line-up is now something of a shambles. 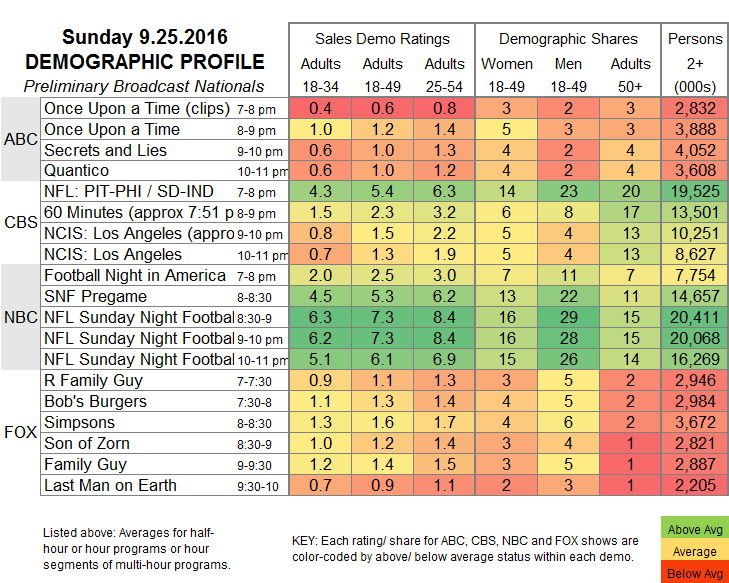 After a 0.6 recap hour, ONCE UPON A TIME’s season premiere was down 0.6 from last fall to 1.2. The quasi-returning SECRETS & LIES (new storyline, mostly new characters) was awful at 1.0, down 0.4 from the debut of last fall’s flop BLOOD & OIL. QUANTICO lost nearly half last year’s series premiere rating, down 0.9 to 1.0 (and at 0.9 in its 2d half-hour). FOX: BOB’S BURGERS was likely boosted by local NFL overruns, but is currently up 0.1 from last fall to 1.3, and THE SIMPSONS is similarly up 0.1 to 1.6. But SON OF ZORN’s 1.2 was 0.3 below the season premiere of BROOKLYN NINE-NINE in its slot last fall, FAMILY GUY slipped 0.1 to 1.4, and THE LAST MAN ON EARTH dropped half a point to 0.9. CBS: The entire line-up was pushed because of the national NFL overrun. Currenty, 60 MINUTES is at 2.3, and the 2-hour NCIS: LA season premiere is at 1.4. 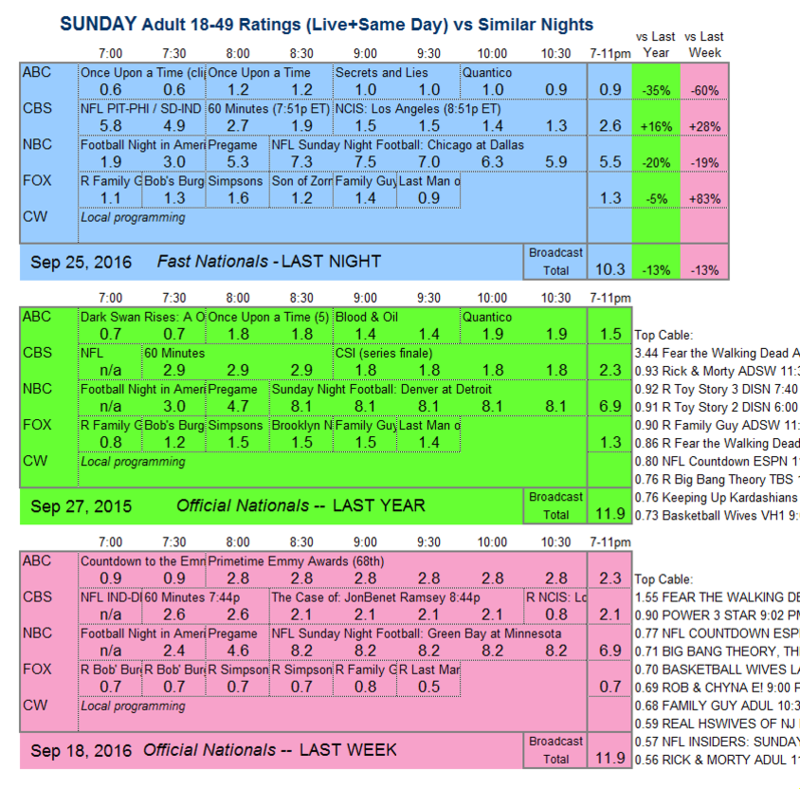 NBC: Even SUNDAY NIGHT FOOTBALL was down, by 0.6 from last week’s preliminary rating to 6.8. The networks will only air regular programming in the 8PM hour tonight, as the PRESIDENTIAL DEBATE will occupy the rest of primetime on all networks (except CW).